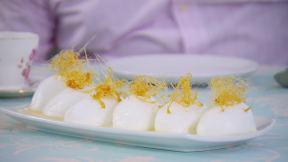 This Floating Islands with Spun Sugar recipe appears as he technical challenge in the Desserts episode of Season 2 of The Great British Baking Show. To prepare the poaching liquid (and what will become the crème anglaise), heat the milk and cream in a large lidded pan or deep-sided frying pan. Stir in the vanilla bean paste and bring to a simmer over a low heat. For the meringues, in a large grease-free bowl use an electric hand whisk to whisk the egg whites together on fast speed, until stiff peaks form when the whisk is removed. Add one tablespoon of the sugar to the egg whites and continue to whisk until the mixture comes back to stiff peaks. Keep adding sugar one tablespoon at a time until 150g/5½oz has been used, and the meringue is thick and glossy. Using two large tablespoons or serving spoons dipped in cold water, shape six large quenelles from the meringue mixture and place in the poaching liquid, over a very low heat for about 9-10 minutes, flipping the quenelles halfway through. Cover the pan with a lid while poaching. Make sure the poaching liquid doesn’t boil or the meringues will puff up then collapse. When the quenelles are really puffed up and cooked, transfer them to a wire rack to drain. For the crème anglaise, pass the poaching milk through a sieve into a large jug. In a large bowl, whisk the egg yolks and caster sugar together until pale and fluffy. Pour over the warm poaching milk, whisking continuously. Pour the mixture into a clean heavy-based pan and cook over a very low heat for 3-4 minutes stirring continuously until smooth and thick enough to coat the back of a spoon. Remove from the heat and set aside. For the spun sugar, melt the sugar, without stirring, in a small stainless steel pan over a medium heat. Grease a rolling pin or knife steel with oil. Take care as the sugar will be very hot. When it turns a dark golden-brown remove from the heat. Leave to cool slightly, then, using the back of a fork, flick the caramel backwards and forward over the rolling pin or knife steel. Gather the strands into rough ball shape and place on a sheet of parchment paper. To serve, pour a little crème anglaise into each serving bowl and float a quenelle of meringue on top. Decorate the quenelle with a ball of spun sugar.